The human body plays host to a number of micro-organisms, most of which are our friends. This is nothing to be grossed out about. In fact, the phenomenon of living in close physical association with other organisms (“symbiosis”) is as common as life itself. The colon has the largest microbial community in the body. In this part of the body, the bacterial population usually doubles once or twice a day. Many of these bacteria are, of course, also excreted during the course of the day, so that a delicate balance is maintained. Under normal circumstances, the microbial community in the colon – which includes more than 300 different species of micro-organisms – regulates itself. Competition between the different micro-organisms, and also between the micro-organisms and their human host, serve to maintain this status quo. These micro-organisms normally prevent infection and proliferation of “bad” bacteria (pathogens like Salmonella and clostridia, for instance), and have a positive effect on nutrition. However, the intestinal environment of the colon can very easily be disturbed. This may change the delicate balance of normal micro-organisms in the colon greatly. Several factors, like stress, altitude changes, starvation, parasitic organisms, diarrhoea, and use of antibiotics, could contribute to such a disruption. When the balance of microbiota is disturbed, one can become susceptible to disease. In these circumstances, boosting the numbers of “good” bacteria present in the gastrointestinal tract can be particularly useful. This is where probiotics come into play. Probiotics are microbial foods (e.g. yoghurt with live AB cultures) or supplements (e.g. chew tablets or capsules) that can be used to change or improve the intestinal bacterial balance to boost the health of the host. The most common forms of probiotics include Lactobacillus and bifidobacteria. These good guys thwart the overgrowth of toxic bacteria by competing for attachment sites and nutrients in the gastrointestinal tract. Lactobacillus and bifidobacteria also produce organic acids that reduce the intestinal pH and retard the growth of “bad”, acid-sensitive bacteria. Fermented dairy products, like live culture yoghurts, kefir (milk drink flavoured with salt or spices) and commercial probiotic preparations, contain Lactobacillus, bifidobacteria, and other forms of beneficial bacteria. Other forms of fermented foods, such as sauerkraut (white cabbage cut finely, salted and fermented in its own liquid), miso (a thick paste made from fermented and processed soy beans) and tempeh (a dish made from split soybeans and water) may also be cultured with Lactobacillus strains. However, the potency and number of live organisms in commercial products may vary greatly. 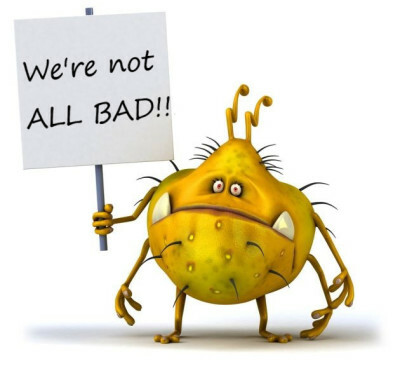 And many manufacturers are finding it difficult to overcome technical problems, especially in terms of keeping the micro-organisms alive under unfriendly conditions. “But probiotics are an asset to the consumer,” says Prof Trevor Britz from the Department of Food Science at the University of Stellenbosch, and these foods should form part of a healthy, balanced diet. When it comes to intestinal health, one also needs to consider prebiotics – non-digestible food products that stimulate the growth of “good” bacteria already present in the colon. Prebiotics include foods that contain substrates, like dietary fibre and fructo-oligosaccharides, that nourish the beneficial micro-organisms in the gut. It is therefore essential to include enough fibre in the diet by eating fruit, vegetables and whole-grains. Food sources of the fructo-oligosaccharides – which should also form part of a healthy diet – include honey, beer, onion, asparagus, rye, banana, maple sugar and oats.